When I started this blog back in 2007, I posted nearly every day for a couple of years. About 2 years ago I got burnt out on it and began dramatically decreasing the number of posts with last year seeing only 4 new posts in total. Ministry Monday’s- Here I will talk about church related stuff. This could be specifically about ExponentialChurch.tv where I pastor or it could be just something random that could help all churches in general. Topical Tuesday’s- On this day I will comment on something that is currently in the news. Whatever Wednesday’s- On this day I’ll talk about whatever I want. If there’s something I need or want to get out there but it doesn’t fit on any of the other days, here is where it will go. Theological Thursday’s- On this day I will answer questions about the bible, God, Christianity, etc. I’m always getting asked interesting questions, so here is a chance for others to hear the answer(s) as well. If you’ve got a question you’d like me to consider answering, you can email me here. I will not use your name so feel free to ask anything! Funny Friday’s- One of my personal values is to laugh everyday. So on Friday’s I will share a story, clip or link of something that has made me laugh over the previous week. So there you have it…a little bit of something different everyday. I won’t feel obligated to post everyday so if I miss some here and there, don’t freak out. If you didn’t like the outcomes of 2013 and are hoping for better ones in 2014, it will involve you making better decisions. Better decisions only come when you have better thinking. To me, better thinking comes from reading God’s Word. So if you have never read the bible, make 2014, the year that you do so. Now keep in mind that it isn’t 1 book, but rather a collection of 66 books, so I recommend you DON’T just start from the beginning and go to the end. Rather start with the New Testament book of Matthew and proceed throughout the entire New Testament. Then you can go back and read the Old Testament. Have a Happy New Year everyone…hope you enjoy the new format to the blog! 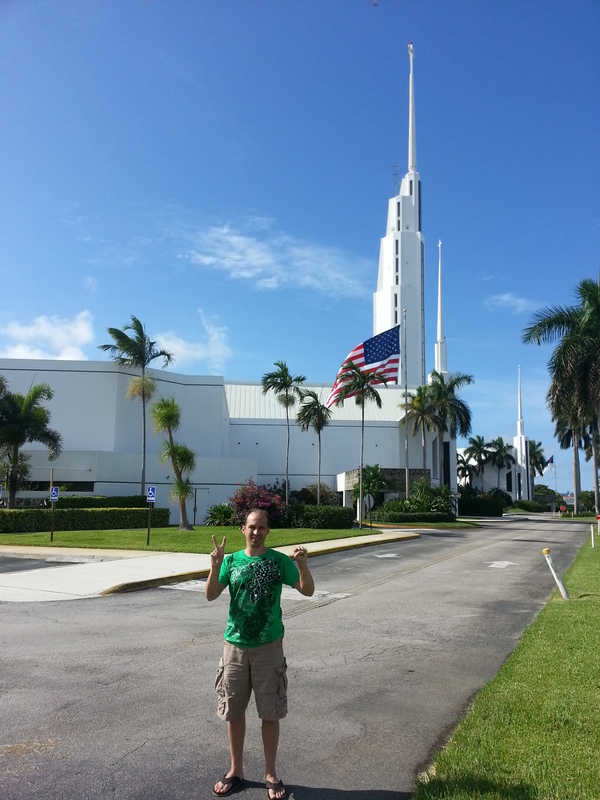 The picture above was taken a few weeks ago in front of Coral Ridge Church, in Ft. Lauderdale. FL. I had Lisa snap it to commemorate my 20th spiritual birthday, which is today. In 1962 the pastor of this church began a program that helped his congregation share their faith with others. It quickly caught on an spread to other churches throughout the world. On July 27, 1993, two men (Keith Skidmore and Marvin Bower) who were involved in this program at their local church in Maryland showed up on my doorstep on a hot summer night. For the first time in my life, someone explained to me what Jesus, Christianity and the Bible were really all about in a way that made sense. Up until then I thought it was about following a bunch of rules but they explained how I could never be good enough to keep all those rules and that what Jesus really wanted was a relationship with me. So right there on the front porch I asked for His forgiveness and leadership and prayed that we could have the kind of friendship that these two men said we could have. Here we are 20 years later and Jesus has never let me down. He not only became my friend, but my best friend. He’s helped me to become more than I could ever possibly hope or imagine. He’s constantly challenging me to grow in my relationship with Him and others. Most importantly He continues to forgive even when I do stupid sinful stuff that isn’t in my or His best interests. Having just physically turned 40 last month, I’m now basically at the point where I’ve lived half my life following the devil’s plan for happiness and success and half my life following God’s plans and purposes. Let me say unequivocally that this half has been far better. Yes sin has pleasure for a short time, if it didn’t we wouldn’t do it 😉 But if we can take a long term approach and be disciplined to following God’s plan, the joy and the peace of mind that comes with it far surpasses and pleasures that Satan or the world may offer us. So what about you? If God could take a sinner like me and give me a new life, He can do it for you as well! Want to talk about it? Let me know and I can share what was shared with me 20 years ago today…trust me…you want to here it…it’s both life and eternity changing! Happy 19th Birthday to Me! Sorry I haven’t blogged in awhile…sort of got burnt out on it but I couldn’t resist today. Why? Because today I turn 19! “Ummm Gilbert good try but you are a lot older than 19”. Yes physically I am but today marks 19 years since I became a follower of Jesus! This also means that I’ve now spent 19 years serving the devil and 19 years serving Jesus. Now don’t get me wrong…I had some good times during those first 19 years (many times too good of times) but I can say beyond a shadow of a doubt that these last 19 have been far better. Great ending to the Sun Stand Still series. God definitely moved in a lot of people’s live throughout and today was no exception. Got to sleep in this morning since we had 2 new guys (Justin Good and Bob Geisel) putting out signs. Set-up was radically different than normal since we were missing 4 of our normal people including 3 band members. However, all things considered it went rather smoothly. The exception was I ended up being the one hanging the “sun” props. I actually had a dream about it last night where I fell off the ladder…woke up with my heart beating a million miles per hour. So I was a bit gun-shy doing it for real today…especially when I got light-headed at one point and nearly fell off for real. Aaron did a great job leading worship again today in Bill’s absence (and no they still haven’t had the baby). Also great to have Evan Reichley sitting in on drums. He brought his own drum stool which really looked cool…sort of Captain America(ish). Chad is doing an awesome job in his new role of coordinating all the people serving on Sunday’s which has taken yet another big stress off of me. The Experience itself started out weird with one of the lights going on and off. Really quickly grabbed another power strip since that appeared to be the issue but now looking at the picture for this post, I’m not sure it didn’t malfunction again. Weird only having a 4 man band but they did a great job. I think this was the worst of the messages in the series both from a content and presentation perspective but once again many people afterward were talking about how it impacted them. Glad God can take my efforts and use it to change lives! The lady I gave the $100 to came up afterward and shared her story…really cool. Also it was great to hear that others of you stopped her and gave her even more money! To hear why I gave her the money you can listen to it here. The main theme of the message was what to do when you start chasing your miracle but opposition starts to come. Again you can listen to it and all the messages in this series by clicking here. Next week we begin a new series called, “Family: Putting the Pieces Back Together”. If you’re interested in knowing how to be a better parent or you know someone that needs some help, then don’t miss this series. Tomorrow I’ll post a Facebook invite that you can use in addition to the invite cards we passed out today. If you need more invite cards, please let me know and we’ll get them to you. Don’t forget the difference passing out just 5 cards per week can make! Also don’t forget to participate in March MADness this week and bring your bookmark back with your story written out. Have a great week…can’t wait to start the new series with you and hear your stories of how you’re making a difference! Saw 8 more people give their lives to Jesus! Had a lot of new people doing “First Serves” today. So awesome seeing people step up and use their gifts, skills, talents and abilities to serve others. Great having church planters, Luke and Sabrina from Raleigh, North Carolina with us this morning observing what was happening and then having lunch with them at the Rock Bass Grill. Holy cow is that some good food. Also awesome having Aaron Hoke leading worship for us today. Aaron is normally one of our guitarists but with Bill away for a few weeks while he and Meghan welcome a new child into the world, Aaron is stepping up and did great! FYI, Meghan was there today along with Bill…she’s now past due by a couple of days…they’re hoping for a Leap Year baby now. Not a lot else to report for the day…pretty smooth. I preached part 2 of the Sun Stand Still series on how to turn your pitiful prayers into powerful ones. Based on Facebook comments, it apparently was a good and convicting message. You can listen to it here as I taught on how to pray using an acrostic for the word ASK. Next week we’ll wrap the series up by looking at what to do when opposition comes to your new life of faith. See you then…hopefully with a friend or two.